The Workplace"Workplace" describes the Autotask Workplace service in its entirety. Outlook Plugin allows you to send Workplace projects, folders, and file links from within Microsoft Outlook, making it easier than ever to share files and providing a simple way for files to be accessed and downloaded by recipients. This helps prevent your emails from bouncing because the recipient's mail server doesn't permit attachments or because mail servers on either end block an attachment it due to size restrictions. 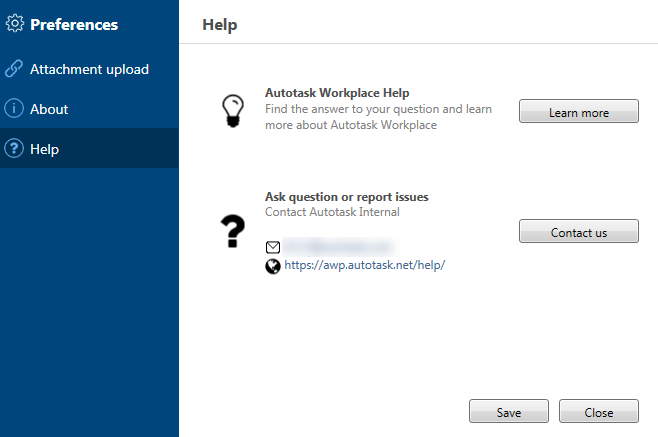 To associate the Outlook plugin with a different Workplace account, refer to Can I change the Workplace account my Outlook plugin is associated with? 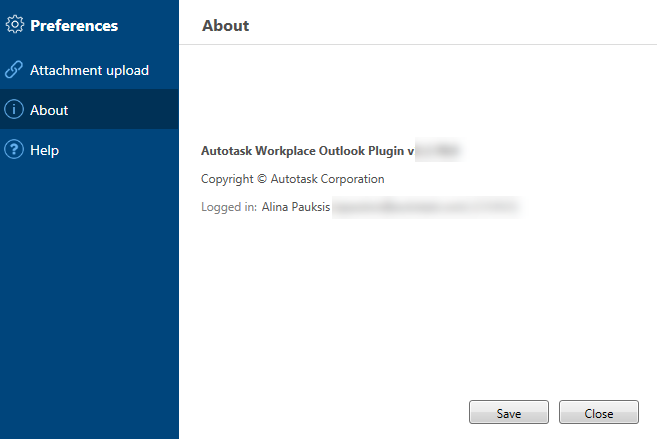 Confirm that the Enable Outlook Plugin option on the Workplace Sync Tab of Workplace Desktop is selected. If the option is disabled, please speak with your Workplace Administrator. In Outlook, click New Email. Select one of these options and proceed as described below. 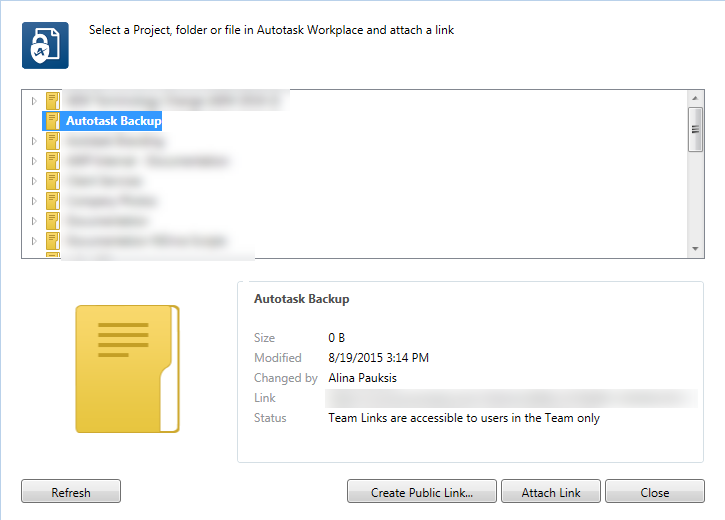 If the file already exists within Workplace, select this option to insert a link to the file into the email. Information about the selected project, folder, or file is displayed in the lower section of the window. If you suspect the content of your Workplace folder has changed since you opened this window, click the Refresh button to update the available folders and files. 3. Select one of the options listed below. Please note that the available options will change depending on the item you select and your permissions. Create Public Link... - this option will create a link accessible to anyone via a public URL and insert the public link into the body of the email. 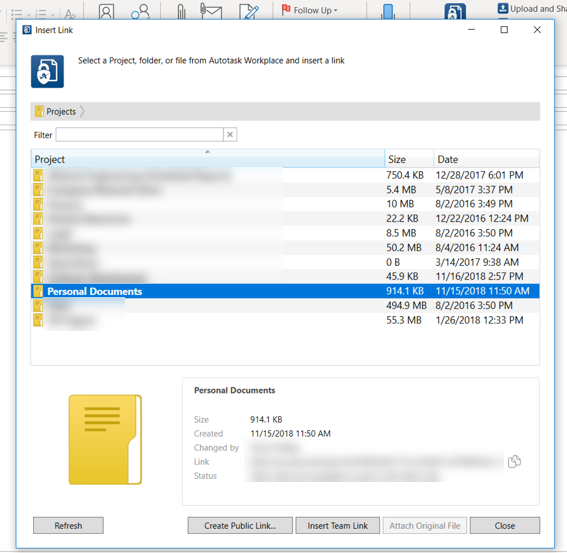 If the project, folder, or file has already has a public share created, this option will change to Edit Public Link..., allowing you to amend the settings of the public share. For more information, refer to Manage Project, Folder, and File Public Shares. This option is disabled if you do not have permission to create public shares. Insert Public Link or Insert TeamA team is an entity, usually a company, which subscribes to the Workplace service. A team is made up of members and connections. Link - this option will insert a link into the body of the email. Public links (public shares) are accessible by any recipient. Team links (team shares) are only accessible by users with whom the file is already shared within Workplace. Attach Original File - this option, only available for files, will simply attach the original file to the email. Close - this option will cancel the operation. The Upload and Share option allows you to select a file and upload it to a specified location within Workplace. The subsequently created link can then be inserted into the body of the email. To create a new folder in Workplace, click Add Folder, enter the name of the new folder in the resulting popup, then click Add Folder. Click Upload and Insert Link.... The file will upload. Navigate to the file you wish to upload and click Open. Files will be uploaded to an automatically created "Outlook Attachments" project. Create Public Link... - this option will create a link accessible to anyone via a public URL and insert the link into the body of the email. 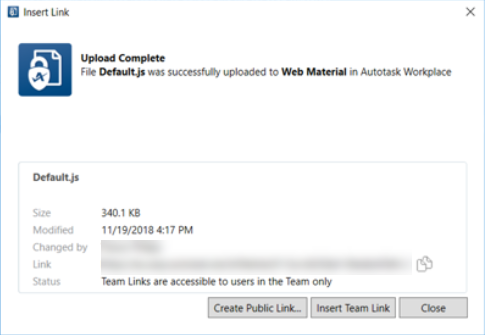 Insert Team Link - this option will insert the link into the body of the email. Team links are only accessible to users with whom the file is already shared within Workplace. This feature will not work if you right-click a file and select Send To > Mail Recipient. You must create a new email via Outlook and then attach a file. Create your email and add an attachment as you normally would. 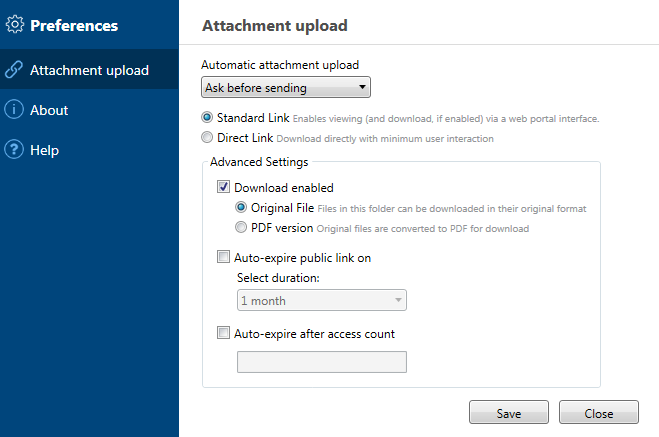 Update your settings as described in Step 3 of Set your attachment upload preferences. 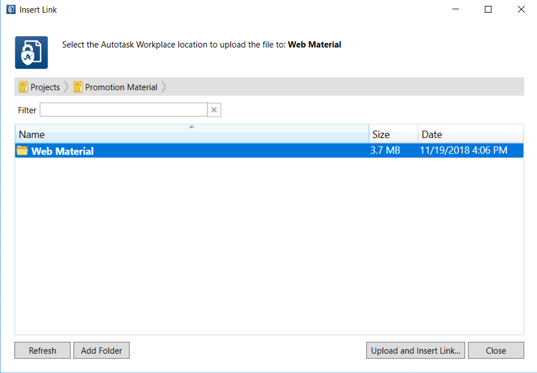 When you attach a file to an email, Workplace can automatically upload the file to an “Outlook Attachments” project and create a public share. The link will replace the standard attachment in your email. For more information about public shares, refer to Manage Project, Folder, and File Public Shares. Standard Link Select this option to use a standard link, which enables the recipient to view the file via Workplace OnlineWorkplace Online is the web portal that users within a team can use to access their data and administer their team.. To enable and/or configure recipient file download, see Download enabled, below. Direct Link Select this option to allow recipients to download the file directly, which minimizes user interaction. This option is only available if you have selected the Standard Link option, above. 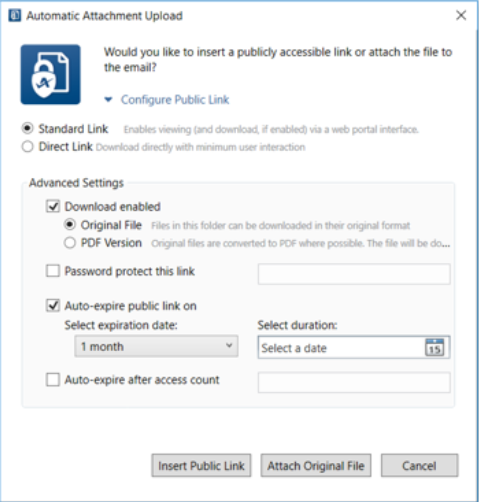 Auto-expire public link in Select this option to disable the public share after a certain amount of time has passed. Then select the duration for which the link will remain valid. Select this option to disable the public share after it has been accessed by the recipient a specified number of times. Then enter the access count for which the link will remain valid.